Richard Burden: […] My final point is about child prisoners. We have already mentioned the prisoner swap that rightly led to the release of Gilad Shalit and of some 500 Palestinian prisoners. The second phase of that prisoner swap will take place over the coming weeks. But there are 150 Palestinian children in Israeli military detention. So far, none of those is scheduled to be part of that prisoner swap. Several recent delegations to the west bank and Israel—organised by the Britain-Palestine all-party group, which I chair, and other organisations—have been to the Israeli military courts where those children are tried. Like other hon. Members, I had already read the testimonies about how the laws applying to Palestinian children are different from those applying to Israeli children; about how Palestinian children are tried in military courts, but Israeli children, even in the occupied territories, are tried in civilian courts; about how many Palestinian children are given bail compared to how many Israeli children are given bail. But I was not prepared for the sight in a military prison—one of the most secure compounds I have ever visited—of 14-year-old boys shuffling in wearing leg-irons and handcuffs for their court hearings. All members of the all-party parliamentary group who were on that visit made the decision that we were not prepared to shut up about this. Something had to be done. Whatever one’s views on the occupation, on Israel and on the peace process, shackling 14-year-old boys is wrong. It is against the UN convention on the rights of the child and it is inhuman. Ann Clwyd: Earlier this year, I was invited by the United Nations to a conference in Vienna on the inalienable rights of the Palestinian people. It was the first time that I could remember the UN holding a conference with such a title. There were testimonies from people that made exactly the same point as my hon. Friend. Children are quite often charged without having a responsible adult present or legal representation. The stories that we heard were very similar to those he is describing now. It is an absolute disgrace that many of these children are in prison simply for throwing stones. Richard Burden: My right hon. Friend is absolutely right about that. The biggest number of accusations is for throwing stones. A range of human rights organisations, including Israeli human rights organisations as well as Palestinian and international ones, and the United Nations have amassed loads of evidence showing how children are visited and arrested in the middle of the night and painfully tied with a single plastic cord in violation of Israeli army procedures. The issue of how the children are interrogated and who is allowed to be present is a matter of real concern. Interrogations are not video recorded. Children continue to be denied bail in about 90% of cases, and many are detained in prisons outside the occupied territories in violation of article 76 of the fourth Geneva convention. Those things are wrong. Even though I thought I knew a fair bit about child prisoners in Palestine, I came across something last week that astonished me even more. I spoke to some ex-detainees in Bethlehem. Most of them came from the town of Hebron or thereabouts. They recounted some of the things that my right hon. Friend has said, that I have said and that the UN has reported, but I wanted to pursue this issue of why they were shackled and had leg irons on inside a prison. I asked the young boy whether he was shackled the whole time. He said, “Yes.” Other young men around the room nodded in agreement and said that that had happened to them as well. I asked the young boy where they were being held. He said, “We were in this kind of prison bus which had rooms in.” I assumed that it was like prison transport with compartments. He said, “It was a bit overcrowded, but we just had to stay there with our shackles and leg irons.” I asked, “What happened if you wanted to go to the toilet?” He replied, “We just had to do it where we were.” This is the 21st century. Irrespective of our views on the Israel-Palestine conflict, are we honestly saying that those sorts of things should go on? I know that the Minister and the Government are concerned about this matter. I welcome the work that both our ambassador in Tel Aviv and our consular-general in east Jerusalem have been doing to raise awareness of these and many other issues. There is another inquiry going on at the moment into the condition of child prisoners. This is an issue that must not go away because it is shocking to me and shocking to anyone who sees it. It is against the UN convention on the rights of the child and it is inhuman. I have been raising these matters over a period of time —perhaps I have been a bit of a bore on the matter— but it is only in the past few days and weeks that we have seen a change in profile and a number of achievements. Israel has equalised the age at which a child is classified an adult—from 16 to 18. The age is now equal between Israelis and Palestinians, which is good. It would not have happened had it not been for the pressure that has been building up. The number of Palestinian children in Israeli jails is now 150; it was 164 a few weeks ago, so I think the Israelis are susceptible to pressure. Israel’s military has test-fired a missile which is reportedly capable of delivering a nuclear warhead to any part of the Middle East and probably as far as Europe. It comes amid speculation that Tel Aviv is planning a military strike on Iran. The test on Wednesday was reported with little detail by Israel’s Defense Ministry. The plume left by the missile went almost straight upwards and could be seen from most parts of central Israel, reports Reuters citing eyewitness accounts. Both local and international media believe that the missile tested was the long-range ballistic missile Jericho III. The specifications of the weapon are classified, but estimates by military experts believe it to be a three-stage solid propellant missile with a payload of more than 1,000 kilograms, which is enough to carry a nuclear warhead. It may have range of more than 11,000 kilometers and could carry a payload MIRVed warheads of smaller yield. The news comes amid a flurry of media reports in Israel, which say Prime Minister Benjamin Netanyahu and the cabinet are contemplating an attack on Iran. The reports have not been officially commented on. Some analysts believe that the government is playing a strongman card to appeal to voters after Israel’s failure to prevent Palestine’s admission to UNESCO. Israel and its allies are calling to put pressure on Iran over its alleged intention to produce a nuclear weapon. Tehran denies the allegations. In the past Israeli air forces have attacked sites which were believe to be nuclear facilities, in Iraq in 1981 and in Syria in 2007. The Jewish State itself has neither confirmed nor denied having a nuclear arsenal, but is widely believed to have such weapons in its possession. Wat zijn de basisprincipes waar het ethische systeem in de islam? Er zijn vier belangrijke thema’s in de koran, waar gerechtigheid er één van is. Een onderdeel van het brede onderwerp van gerechtigheid is het ethische waardensysteem. In de koran wordt het woord adab gebruikt, om het beheersen van het denken, of elke andere lovenswaardige vorm van beheersing, waarmee mensen zich ergens in bekwamen, mee aan te duiden. Goede zeden en goede manieren (de basis van elk ethisch systeem) worden als de ware test van iemands capaciteiten beschouwd. De koran stelt: “…Voor het oog van God is de meest edele onder u diegene die het beste gedrag vertoond …” (49:13). Dit is verder bevestigd door profeet Mohammed (vzmh) toen hij zei: “… de beste onder u zijn degenen met de voortreffelijkste moraal …” Want alleen wanneer mensen in ethisch opzicht uitblinken, zullen zij zichzelf en anderen in de samenleving geen schade berokkenen, wat tot vrede en geluk voor allen zal leiden. German official, speaking on condition of anonymity, says his country set aside $180 million to fund about a third of another Dolphin-type submarine. A senior German official said Wednesday that the government has approved the subsidized sale of another Dolphin-type military submarine to Israel. The official said Germany has set aside €135 million ($180 million) in next year’s budget to pay for about a third of its cost. Dolphin-class submarines are capable of carrying nuclear-tipped missiles, but there is no evidence that Israel has armed them with such weapons. Israel already has three Dolphin submarines from Germany — one half-funded and two entirely funded by Berlin, a staunch Israeli ally. The official, speaking on condition of anonymity because of the sensitivity of the issue, said Wednesday a 2005 agreement between the two nations included an option for another subsidized submarine which was now activated at Israel’s request. During a recent Friday sermon, a young Muslim sitting next to me took out his Blackberry and started to check his messages (while the Imam was giving his speech). I was quite stunned. The young man then put away his smartphone, but 10 minutes later took it out again and typed a few things. That gave me a good indication of both his (short) attention span and the addiction to cyberspace that youngsters have fallen victim to these days. I could not shake off this little scene from my mind, so I later googled “Twitter and religious services”, and lo and behold, I found pages titled “Tweeting during church services gets blessing of pastors” (an article in the Houston Chronicle two years ago) and “Does God Tweet?“, an online forum organized by the Washington Post two years ago, where 16 contributors presented their thoughts on whether a relationship with God can be established through Twitter. Can prayer be reduced to a 140-character statement? Can we no longer free our minds, quiet our inner selves, focus on our spiritual dimension, and establish a meaningful religious state of being? I thus wondered how Twitter, Facebook, and current and future social networking and micro-blogging tools will affect religions in general and Islam in particular. My worries were heightened when I found an article titled “25 Reasons Why Twitter Is Spiritual,” but none of the reasons were remotely convincing. Facebook poses another set of challenges and concerns for Muslims. First and foremost is the freedom of speech that either can be much greater than many Muslims are accustomed to (in their countries) or can be abused to the point of becoming hate speech. There have already been a number of instances where a page was set up to publicly and crudely “criticize” Islam, and last month an Egyptian was jailed for “insulting Islam” on Facebook. In reaction to this, some Muslims have either waged Facebook-boycott campaigns or just went ahead and created Muslim social networks, e.g. Muslimsocial.com, Muxlim.com, or Naseeb.com. Other concerns that many Muslims have with Facebook relate to the loss of “virtual modesty,” of “correct behavior” and of privacy. The concern over “modesty” refers to images that can be deemed indecent. “Correct behavior” decries the loss of inhibition that people exhibit online, often in stark contrast to their everyday personalities, and the hypocrisy of voicing views online that are quite different from one’s beliefs and practices in “real life”. And the issue of privacy online is well known. Finally, there is the huge problem of time waste in social-networking activity. Two years ago, a study was conducted among evangelical Christian college students; these were found to spend an average of 18.6 hours a week on social media, half of that on Facebook. Interestingly, 54 percent of these religious students reported that “they were neglecting important areas in their life due to spending too much time [on that activity].” On the other hand, 43 percent of the students stated that this helped alleviate stress in their lives, and 35 percent reported that their social relationships were improved by that. The authors of the study warned against the negative impact that this time waste will have on the religious activities (prayer, Bible study, attending services, serving others, etc.) of the users of social media. Two conferences have recently been devoted to exploring the impact of ‘new media’ on the discourse among Muslims (worldwide) and with other religious communities (interfaith dialogues). Last April, an online “conference” was organized on “The Future of Islam in the Age of New Media,” which consisted of 60 speakers, who each spoke for one minute on the topic. Most of the speakers spoke enthusiastically about the effects that the new media are having on the Islamic discourse and culture. Some participants, however, expressed some interesting concerns. The most important effect that was highlighted is that the new media are allowing a larger exposure of ideas regarding Islam and giving people new freedoms to discover or express thoughts that have often been hidden from view. Muslims are becoming more aware of the diversity within their tradition and can now shape their opinions in a more informed way. This democratization of the Islamic opinions, however, has turned into a “fragmentation,” a plethora of views with no core or reference frame. Moreover, a “ghettoization of views” has occurred (as has been observed with other obscure views or groups): liked-minded people linking up and reinforcing each other’s views. There is also much greater female participation in the discussions concerning Islam, as Muslim women have avidly taken to blogging, even in the more conservative countries. The new media also offer interesting opportunities for exchanges with “others,” a chance to counter Islamophobia or just plain ignorance, provided that one gets out of his/her “ghetto” or bubble of similar views. However, one must be careful not to give these new tools more credit or power than they actually have. After all, only a small fraction (10 to 15 percent) of Muslims worldwide has access to the internet, according to the 2011 Global Information Technology Report. Moreover, the internet and the new media, require a certain level of education and sophistication. Thus, the impact that the new media are having on Muslims’ views and understanding of their religion is — for now — largely confined to the well-educated segments of society. The organizer of this online conference has now started a second phase of the project, where some of the speakers are brought back for more in-depth interviews. They will be exploring the main themes that emerged in Phase 1. The other conference I wish to highlight is one that was recently devoted to the exploration of the effect of social networks on interfaith dialogues: “Social Media and Inter-Religious Dialogue: A New Relationship,” which was organized in October 2011 in Doha, Qatar. The conference aimed at addressing a number of themes, including: social media as a tool for dialogue instead of hateful attacks, and how to develop religious frameworks and ethical regulations to protect society from the misuse of these tools — a ‘Global Code of Conduct’ for respecting sanctities and religions. Clearly, the new media and social networks have created a new dynamic within religious communities, including Muslims. Some effects are already being felt, both in the practice and in the formulation and understanding of the religion itself. This is one of the most important developments of our times. TEL AVIV, Israel (Ma’an) — An Israeli lawmaker on Wednesday described Israel’s security situation as the “most dangerous”, in remarks during a meeting of the foreign and security ministries. Benjamin Ben-Eliezer told lawmakers at the meeting that “Israel has never been in more dangerous situation than the current one”, according to Hebrew-language press accounts. He called on Israeli officials to act responsibly and not to reduce the budget of the army and security services, into which he said both Jewish and Arab citizens of Israel should be drafted. Political Islamists look likely to dominate Egypt‘s first post-Mubarak parliament after sweeping victories for religious parties in the first round of elections. With preliminary results beginning to trickle through from Cairo, Alexandria and seven other regions, the Muslim Brotherhood‘s Freedom and Justice party appears on course to emerge as the biggest single winner, with some analysts estimating they will capture about 40% of seats in the new legislature. Al-Nour, a more conservative Salafist party, looks likely to secure second place. Despite some notable individual triumphs, Egypt’s liberal and leftist political forces appear to have fallen short compared with their rivals, though the Egyptian Bloc – a largely secular alliance headed by the billionaire telecoms tycoon Naguib Sawiris – will be encouraged by its strong showing in certain districts in the capital. Official results from the first round will not be announced until Thursday , before a series of runoff ballots on Monday next week. Under a complex electoral system, the country is heading to the polls in three regional phases, with final results for the lower house of parliament to be revealed on 13 January and for the upper house on 14 March. Some Egyptians took to social media sites to express alarm at the prospect of an Islamist-dominated parliament. But experts in political Islam, such as Khalil al-Anani, a political researcher at Durham University, argued the Islamists are not a monolithic bloc and fear of them mainly stems from the legacy of Hosni Mubarak, who used the “scarecrow” of religious politics to justify his own repressive rule. “This is the result we would have seen had genuine democratic elections been held at any time since the last revolution in 1952,” Anani said. “We are talking about a very strong and well-organised social movement which has been working on the street for decades and making the effort to address people’s needs rather than push its own ideology. “It’s a defining moment in modern Egyptian history because it’s the first time that Islamist parties will have the upper hand in the realm of formal politics, which is a pattern being repeated in Tunisia, Morocco and maybe Yemen too,” he added. “Islamists are moving from opposition to power, and although it offers them an opportunity it also presents them with an immense challenge in terms of how they will handle these new responsibilities as they move from the political fringes to the political centre. Taking place against the backdrop of renewed street clashes between revolutionaries and security forces that left more than 40 dead and thousands injured, there was widespread relief that the first round of polling involved little serious violence. 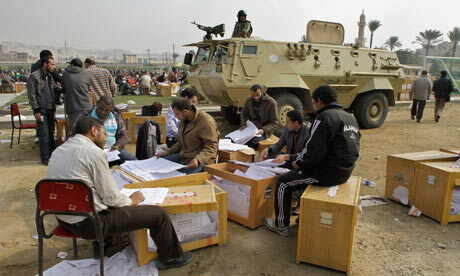 Instead, a higher than expected turnout saw millions of Egyptians queuing for hours to cast their ballot, and despite multiple reports of local violations there was no evidence of the systematic vote-rigging that became a hallmark of sham elections under the Mubarak regime. But just moments after polling stations closed on Tuesday night, fresh fighting broke out in central Cairo between pro-junta attackers and protesters camped in Tahrir Square.The Ministry of Health said that more than 100 people had been injured and 10 were in a critical condition. Meanwhile Alaa Abd El Fattah, a leading critic of army rule who was jailed by a military tribunal last month and has since become a rallying figure for anti-junta demonstrators, saw his detention extended for at least another fifteen days. He and a series of co-defendants now stand accused of participating in an illegal assembly, endangering public peace with the intention to commit crimes including murder, possession of weapons and the attempt to storm a public building with violence. The United Nations and numerous human rights organisations have described Abd El Fattah’s incarceration as politically-motivated and have called on the junta to release him. GAZA CITY (Ma’an) — Israel is refusing to allow technicians to repair a main power line supplying the Gaza Strip, a spokesman for Gaza’s electricity company said Wednesday. Jamal Dardasawi said the line has been down for 13 days, exacerbating the electricity crisis in the coastal enclave. The Israeli government has not allowed technicians from the Israel Electric Company or from Gaza to repair the line, which usually provided 12 Megawatts of power, Dardasawi said. 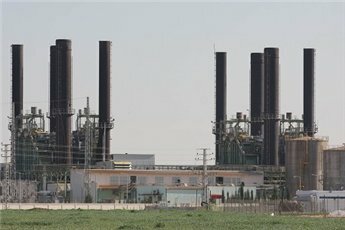 Gaza’s power company has been applying an emergency distribution program, disconnecting the power grids for eight hours every day. Dardasawi noted that the problem coincided with threats by Israel’s foreign ministry to cut off water and electricity to Gaza if Fatah and Hamas formed a unity government. Senior engineer Ahmad Abu al-Amrein said the shortage of power in the Gaza Strip had reached 37.3 percent. The coastal enclave needs 300 Megawatts to meet residents’ needs, but only 188 Megawatts are available, al-Amrein said. Israel provided 108 Megawatts, Gaza’s sole power plant generated 63 Megawatts and Egypt supplied 17 Megawatts, he explained.